Not in this house! Camryn has found her hair clips!!! It now is an out going battle to keep them in. However, I will not be defeated. I will continue to put them in her hair over and over until she realizes she will not win! Here she is all cute with her hair all done in her brand new awesome (FREE...from Ryan's dad, thanks Mattel/Fisher Price) Dwell high chair! Then moments later this is what she looks like! This is the game we play over and over, I put the clip in, it is so cute, then within minutes it is pulled out! I had a little girl not a boy. I believe it is my duty to make sure she stays looking like one! I know that she is cute without them but we all know how much cuter she looks with one in. So until their are screaming tantrums and endless time outs I will continue to play her game! 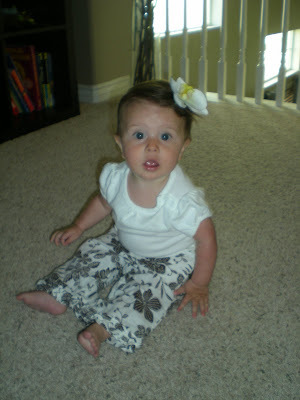 i love that flower in her hair! it's so adorable! 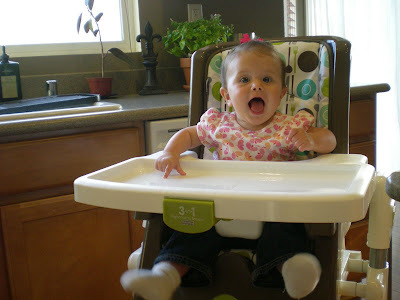 and that high chair is fabulous, gotta love dwell products! My vote is on Camryn winning this game; however, I know no one will try harder keeping those bows in her hair than you! Let the games begin....to be continued. What a hilarious game! I wonder if she will loose all her hair while you try to wait her out. I think I played this game too and that's why all the little piggies had to be put in the back beyond reach. Don't give up the fight! How unfortunate! I've been so impressed that it hadn't already been a problem. It's so sad because she actually has lots of hair to put in a bow that most babies don't have...so she owes it to little girls everywhere to wear her bows with pride:) And they are so cute on her! Win, win, win! Hee hee! Let the battles begin. It will be the first of many, let me tell you!! I am hoping for your success but not betting on it. :) I'm with Carrie - because she actually has tons to put back. 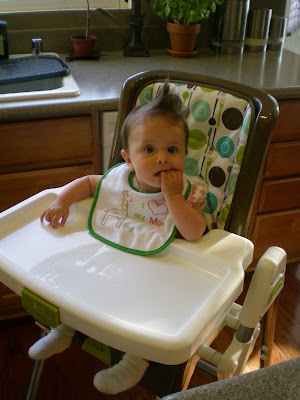 I love her in the high chair with the sticky upy. 10 lbs in 6 weeks...wanna bet?